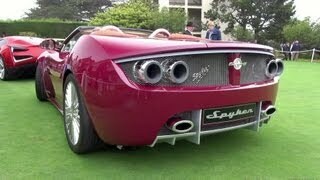 Spyker has unveiled the B6 Venator Spyder concept at Pebble Beach, California. 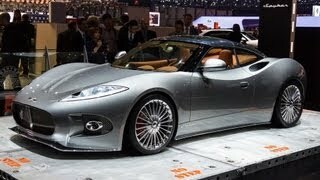 This is the spyder version of the new exotic sports car, the Spyker B6 Venator. 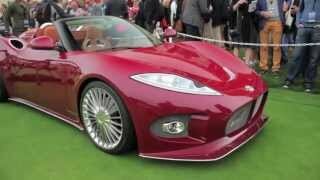 The Spyker B6 Venator Spyder Concept incorporates vintage cues of the brand's aviation past, highly detailed design and bespoke materials into a defiantly contemporary statement that could only come from Spyker. The model features the trademark radiator grille’e mesh in V-shape, carbon fiber body which sits on an aluminum platform, LED headlights, the brands axiom "Nulla tenaci invia est via" (“For the tenacious no road is impassable") and 19” Turbofan alloy wheels. Interior is crafted from the finest materials and comes equipped with premium leather upholstery, turned aluminium fascia and the trademark exposed gear change mechanism. Also seen is a three-spoke steering wheel, an infotainment system and an aircraft-inspired instrumentation. 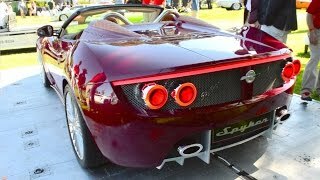 The B6 Venator Spyder concept is powered by a rear-mid mounted V6 engine delivering more than 375 bph (279 kW). It is connected to a six-speed automatic transmission sending power to the rear wheels. 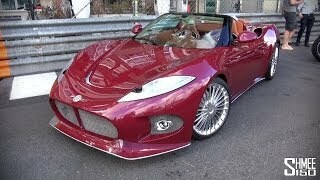 The Spyker B6 Venator Spyder Concept will be available at a more accessible price point of approximately $150,000.